What’s unusual about this photo? 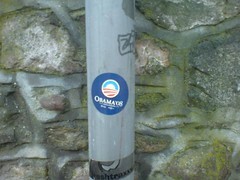 Not an awful lot at first glance – seeing an Obama 08 sticker on a lamp post is probably a very common site. Except this photo was taken a couple of streets away from where I live (by me). Unless Barack is running for Bristol City Council as a back-up in case he loses, I can’t see it swinging too many votes. After all the data from If The World Could Vote seems pretty much in his favour! Tomorrow – a small slice of American pie! Intute: Social Sciences features more Internet resources on the US Election.